Three birthday parties, three weeks in a row. This is insane. Two down, one to go. I'm hoping there's some creativity left somewhere inside of me to pull off the last one. 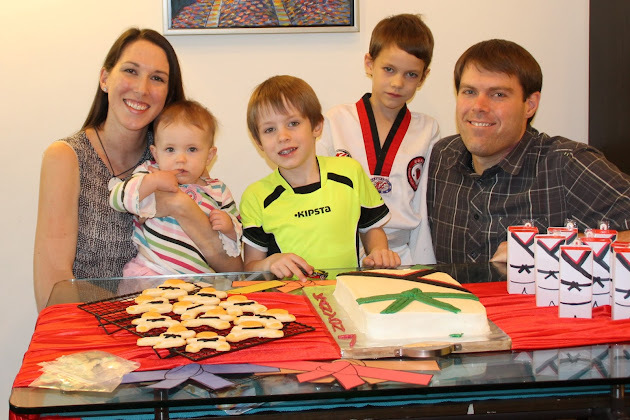 Here's a quick recap of party number two: Kanyon's Taekwondo party! Kanyon doesn't do anything he's truly interested in halfway. If he's in, he's all in. So when he signed up for Taekwondo as an after school activity this year, he's been all about it ever since. He wore his uniform for Halloween and also wanted a Taekwondo themed party. I liked the simple cake and red and black accents. He wanted a green belt on the cake because he thought it would look better than a white belt and taste better than a black belt. He also wanted to decorate the cake himself. Yikes. Maybe next year?? We kicked off the party by saying "Sensei says." It's like Simon says, but Simon is Sensei, not Simon. Got it? Ok. "Sensei says, 'Say Cheese!'" Next up, we had a scavenger hunt to find Taekwondo belts. Each clue was hidden inside a "punch box." To get the clue, you had to punch through the paper on the box and find the clue inside which led you to the belt. The belts were in order by color and when each one was found we learned about the meaning of each color. The punch box was a big hit and a few of the boys punched a little harder than I was anticipating...almost punching through the back of the box! Jeremy quickly reset the box with fresh paper and a new clue inside as the herd of boys went off to locate the next clue. After the scavenger hunt, the boys got creative and decorated a ninja cookie with edible food markers. I had to talk them into it (because we all know how much seven year old boys love to color) but they quickly came around and found they really do like coloring on food. I was surprised that this little group was more interested in playing together than eating snacks and having cake. The time flew by, and before we knew it, we were busting the pinata, handing out goodie bags and saying goodbye.